Macaroni and cheese: Everyone knows cauliflower and cheese go together and this is a perfect example. 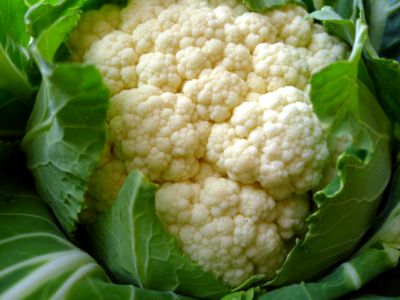 A bit of steamed or lightly boiled cauliflower can become a meal rather than a side dish by adding some carbs – definitely worth a try in this killer mac and cheese or any other creamy pasta dish. Picallili: Preserves usually make people think of summer fruit jams or apples and onions for chutney but picallili is a great way to preserve other vegetables like cauliflower and tastes so much better homemade than what you buy in the shops. Curry: Cauliflower is a classic vegetable for a curry and this is my go-to veggie curry recipe – a super simple jalfrezi that could never be accused of being a blander cousin to a meat dish. Delicious! Preheat the oven to 190C. 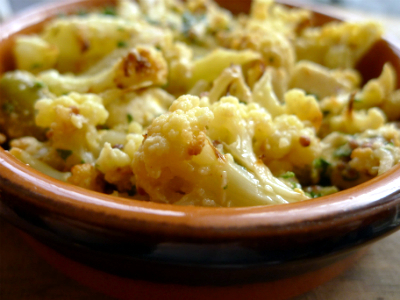 Place cauliflower florets on a baking tray, drizzle with oil and season. Stir to ensure the florets are evenly covered and place in the top of the oven. Roast until the cauliflower has softened and the edges start to brown, about 20 minutes. While the cauliflower is cooking, make the dressing. First combine all the ingredients up to the lemon juice and leave to sit for 10-15 minutes. Then add the honey and oil and season to taste. 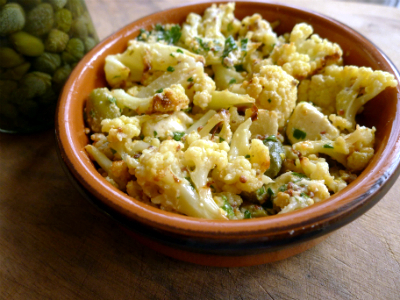 Be careful not to over-season as the capers and olives are quite salty and the cauliflower has already been seasoned. Chop the parsley. 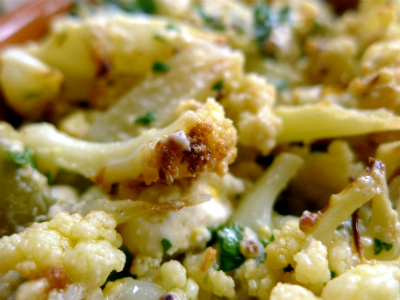 Once the cauliflower is out of the oven, combine with the dressing and parsley in a large bowl. Check seasoning and serve warm (although it’s also lovely once it’s cooled too! ).